The weather forecasters are calling it an Indian summer. 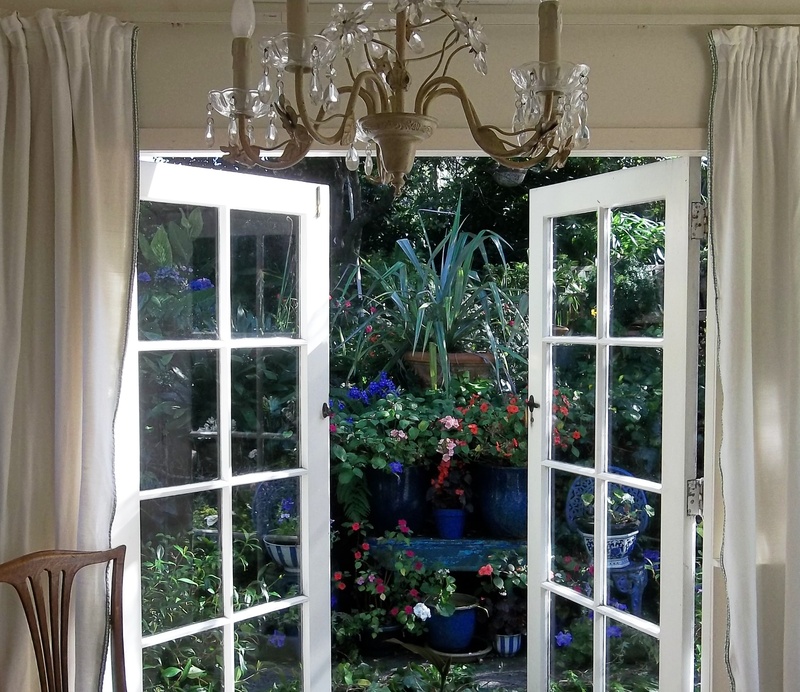 This appals me – sitting here looking out of the French windows, watching butterflies flitting over the hydrangeas, I thought we were still gently making our way through an antipodean summer. Has the time flown so fast that we are in that gap between high summer and early autumn? The din of the cicadas should have warned me, as should the scattered pink blossoms on the plum tree. This bewildered specimen flowers every autumn – fruitlessly – before doing its spring burst of glory. Driving along the roads to town, the verges are blooming with the autumn flowering of scarlet mombretia which have spread through the long golden grass. White oxe-eye daisies grow in clumps among the mombretias, and there are still some red- hot pokers and a few roses flowering as I drive past unkempt hedge-rows bright with a heavy harvest of red hawthorn berries. If it was the northern hemisphere I would repeat to myself the old country lore that we must be going to have a hard winter, and nature is providing for the hungry birds. But we never have hard winters where I live, so I just savour the bounty with no fear for the future. Instead we long for rain. Every year now we have a drought, and it becomes a struggle to keep the garden alive; I use up our precious water to save the white Japanese anenomes for their burst of autumn flowering, and to stop the roses wilting. The purple salvia looks after itself. Glorious scented Jean Ducher, and bright mutabilis keep the cycle of roses going all the year round. And littered around the garden are the shallow plant holders filled with water for thirsty hedgehogs to drink, and where I also see wasps sipping and even a pair of snails making their way together down to the water in a deep bowl. When I looked out of the bedroom window this morning at silent dawn, the sea looked like wet aluminium, the curve of bay on the distant horizon was steel grey, and the clouds overhead, silver- grey. But by the time I drove into town for shopping, the sun had come out. The fields are so dry they are burned to a pale gold, and the pennyroyal is now flowering, making a carpet of purple. That rich purple carpet always reminds me of when I was in France, staying in an ivy- turreted, moated chateau in deepest Vienne as a twelve year old… my best friend there, Josephine, invited me to go mushrooming with her and her maid, so equipped with baskets we set off to find “champignons”, chattering in fractured French and broken English. Two little girls dressed in flowery cotton summer dresses made their way through long wet grass and dewy paths lined on either side with blackberry bushes heavy with fat juicy fruit as big as grapes. We walked through early morning mist, and it suddenly cleared. There in the bright sun-shine in front of us, stretched a shimmering field of tiny pale purple-blue flowers, with hundreds of miniature, deep blue butterflies hovering and fluttering above them. That world was alive with birds and butterflies. Farmers here are feeding out to the cows already, and I fear for the thirsty birds and hedgehogs. As I drove past the agistement fields outside the village, I saw all eight mares spread out round the field in a circle, with their heads thrust deep into bright red plastic buckets; and by the side of each one, their long-legged foal stood patiently, waiting for mother to finish. “I was saving the horse,” was the reply, to which Todd cried despairingly: “What for?” I have used this thought constantly since, so every time I go to save something, I ask myself, what for, and mentally come back to the present, and seize the day! On my own the other day, I decided to lay my lunch on a tray and take it out to the veranda where I look down to the sea through the gnarled branches of spreading pohutakawa trees. It’s shaded from the mid-day sun by dappled light filtered through leaves of the white wisteria. Suddenly I thought – why not use my precious antique green French plates – and green wine glasses – and the best silver – what am I saving them for? This is not seizing the day, I chided myself. This thought has spread into other parts of my consciousness… I’m raiding my store-cupboard – if not now – when ? Why not eat these goodies now? Time to start emptying the deep freeze – what am I saving all this food for? Those pretty shoes – why not wear them today, even if I’m not going anywhere? Maybe I’m becoming a grasshopper – singing the summer through, taking no heed for the morrow – and the prudent ant in me is having a hard job trying to make itself heard. But being a grasshopper seems to mean feeling much satisfaction, joy and being right here in the present. If not now – when? Saving it – what for? Two phrases which are life-changing, ring with truth, and which mean that other cliché – seize the day. So I’ve come to terms with the Indian summer, and revel in these days of softer sun and autumn flowers and golden trees. It’s the time of year for the apple harvest. One of my favourite ways to use them for pudding when we have friends is to allow one apple per person. Take out the cores, and fill the hollow with brown sugar and sultanas, or as I usually do, with left-over Christmas mincemeat. Put them either in an enamel dish or other oven-proof dish, but I love the homely look of an old-fashioned enamel dish for this. Pour cream and whisky over them to come up to about half an inch in the dish. Cover and bake until soft. They’re delicious served on their own or with a crisp biscuit, or for something filling, with a creamy rice pudding. Edward Snowden NSA whistleblower and hero. Magnificent post. Beautiful view out your french doors. I find myself saying “if not now, when” more and more too these days. Enjoy the remaining summer. We need rain in central Australia too! Good on you! ‘If not now, when?’ is a related quote I like. That was a challenge to stand up and do something scary, but sometimes we need to apply the same principle to doing something lovely. We are using my mother’s beautiful crockery in that spirit! Some for her in the rest home and some for us in our own homes. Enriching the now while she is still here, a joy to her, to us children, and to others. Valerie, is that photo at your house? Wow! Beautiful!! Hello Maggie – yes it is my house – a tiny little beach-side cottage which I do my best to make pretty ! Lots of books help ! I find myself asking….”what am I saving this for?” The kids don’t want “old stuff”. They are moderns. So now we eat with sterling silver and crystal….as do the cats. If something breaks….well, just shrug your shoulders. Hope you get some rain. We are finally getting some, but not nearly enough. How lovely the flowers are. I am of that same thought, Valarie. No need to save anything. Use it, enjoy it and savor the moment. Beautiful description of your garden and surrounding area. Like you, we have a wet season and a dry season and most of the time, a mild season, but I sympathize with your need for rain. Poor critters. Good to hear from you Lynne,so glad you enjoyed the garden ! The photo is lovely and the flowers inviting. I wish I could send you some of our snow. We have had a lot of precipitation over the past 2 years but I remember the terrible drought we had in the late 90s. Use your beautiful things. After my mother died, I found lovely dishes and crystal that I never saw her use. She had no place to display them so they were tucked away in her attic. Hello Kate, yes, I would have loved to savour some of your snow… sad about your mother’s stuff… do you use it, or was it too dated for you? It didn’t work for me so I have it to my nephew. Sadly, I believe his wife sold it at a garage sale. I love how you make connections. Have a great weekend! Lovely piece. The transition of seasons is both beautiful and full of uncertainty. My horse with his full fluffy winter coat last autumn told me we were in for a hard winter and it has been that. … Hope you get some rain soon. How interesting that your horse was prepared… I wonder if all other animals were too… so glad you enjoyed the post, thank you..
Hell Amy, so glad you enjoyed the photo… I think we all seem to be agreed, Don;t we ! Dear LInda, so glad you enjoyed my tiny garden… I always love the pictures you post of yours…Yes, Snowden deserves a medal doesn’t he…. I think many ‘things’, ourselves included, suffer and disintegrate if we are shut off, and put away. Beautiful china and linen and silver and jewellery were made to be used and viewed and worn, and to be enhanced/enriched by their life on display. The mauri stone at Te Papa is a good example of how the interaction between people and ‘object’ brings out the beauty of the object, and enhances our spirits as well. So enjoy all your treasures and being a grasshopper. What an interesting comment, Gallivanta… you’re so right …. “Seize the day,” has become such a cliche, we hardly hear it anymore. But “I was saving the horse” and “What for?” makes one sit up and take notice. When the sun comes up tomorrow, will I revel in the day, maybe take out one of the hand-painted cups my grandma painted and have a cup of tea? Thank you for a lovely post. The view through your French Windows is wonderful. Your post took me on a journey through some delicious colours and I was full of jealousy at your stay in the chateau in France. I hope your garden and all it’s visitors survives the drought and that you delight in living in the hear and now, at least till the freezers empty. Beautiful prose Valerie, evocative and picture painting. And yes we should repeatedly seize the moment or the day. I’ve been telling myself its a good day to live. Thank you so much Claire – lovely to hear from you, I’m a bit behind at the moment… glad you appreciated Edward Snowden…. Love the photo, and your words, as always. You inspire me to more. More time for me, more taking down my pretty plates, wonderful glasses, tasting of my favorite wine with a dinner I cook just for me. More planting of Lavender around my back patio. You inspire me just to more. Val, what lovely words you’ve sent me – forgive my tardy reply… things a bit on top of me at the moment… I just loved what you said, thank you, and hope you’re enjoying doing those special things just for you, the most important person in your world !!!. It’s so easy to get caught up in the busyness of life and forget to stop and smell the proverbial roses. I love the idea of not saving your best for special occasions. Your lovely photo makes me feel as if I’ve been invited to share tea with you. Thank you for your hospitality. Hello Rochelle, thank you for your lovely words – you are indeed welcome to pop in for a cup of tea !!!! Your garden is mesmerizing! I am still trying to fathom if it is real or not. My months of white snow on field and sky has caused me to doubt color. Thank you for the reminder that we are all cycling through seasons. Which of your readers doesn’t wish that they could join you, in your garden, in town, as you prepare your tasty dishes, as you reminisce…. And the names of your NZ plants is an additional spicy treat, who coined such colorful names….? Jeffrey, thank you for your lovely appreciative comment, I loved it … the names of flowers – do you know, I think most of them are English names… which are always gorgeous like ‘love lies bleeding, hearts-ease,’ and so on…. What a feast for the senses you serve up for us with your rich descriptions, Valerie. Thank you! What a lovely view you have from your French doors. As the days are warming up here and we are slowly, very slowly, entering Spring, I look forward to the days when I can open my doors into in the garden as well. I’m sitting in a cozy corner of a hospital cafeteria, waiting for my mother to get out of surgery, which makes this post all the more profoundly relevant. Our lives go through stages, accumulation and de-cumulation. We collect things that we put away in safekeeping for some day special. Every day is special – every second. I am learning to accumulate the joy of being alive, every day. We lead remarkable lives, because we have remarkable friends and family.